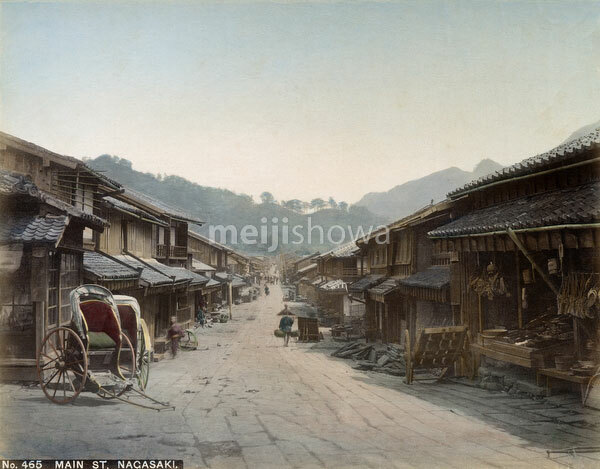 Rickshaws and shops at Umamachi (馬町) and Shindaikumachi (新大工町), now known as Siebold Dori, in Nagasaki. The photographer stood with his back towards Suwa Jinja shrine (諏訪神社). Many carpenters came to this area and established Daikumachi around 1606. When it became too small it was expanded and named Shindaikumachi. In the center of the photo Otebashi (大手橋) is visible. The bridge spanned the Domongawa River (堂門川, currently Nakashimagawa River, 中島川) which separated the two neighborhoods. This road was part of the Nagasaki Kaido (長崎街道), the road connecting Nagasaki with Kokura (小倉). It was used by daimyo for the sankin kotai (参勤交代), their alternate residence in Edo (pre-1868 Tokyo). The delegation of the Dutch trading post at Nagasaki’s Dejima also used this road to visit the Shogun in Edo.